Take a look at what we have available for pontoon rentals. Pontoon boats are on a deliver-only basis due to their size and first five miles are free! After five miles, Lakeside can also deliver your pontoon rental to a surrounding lake! There is a round-trip delivery charge of $3.00 per mile. Minocqua Lakeside offers FREE delivery to most of the boat landings located on the Minocqua Chain of Lakes. 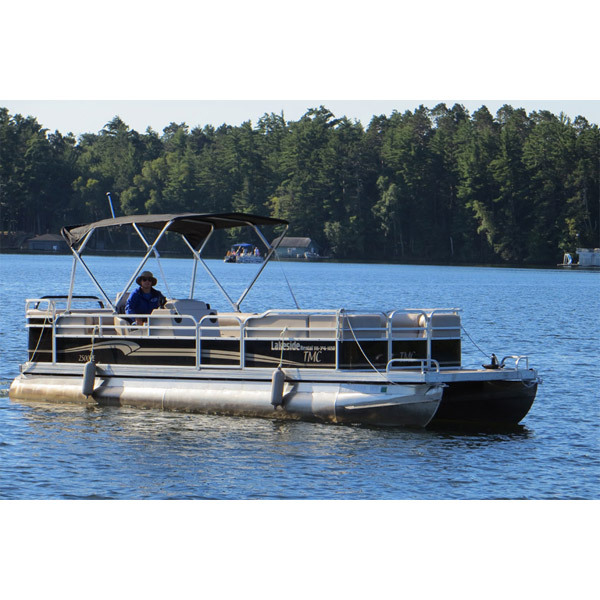 Minocqua Lakeside offers TMC pontoons available for rent! TMC is a pontoon manufacturer and located right here in Wisconsin with over 50 years of pontoon MFG experience. All pontoons come fully equipped with life preservers and throw cushions. Each pontoon is also equipped with an anchor, swimming ladder, canopy top, depth finder, bottom reader, fish finder, and a CD player with IPOD and XM Radio hook ups.